First update from the jungle! Iarrived on Sunday midday at 1pm at the airport in the Puerto Maldonado. After getting a tucktuck at the airport I went to the ports where the boat was waiting. We're waiting until 3pm and picked up the volunteers who spent the weekend in town. 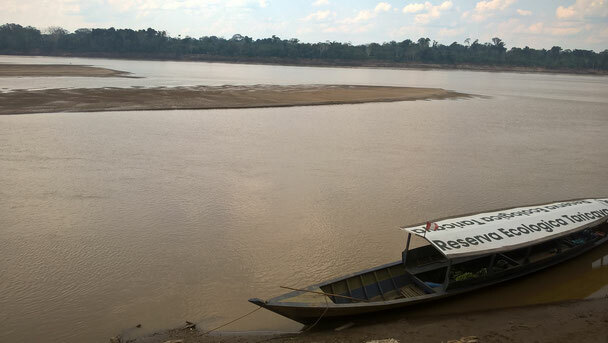 After 1h45 boat drive on the Peruvian jungle river Madre de Dios, we arrived in the nature reserve Taricaya. I had the free choice which bungalo I want to take because there were only few volunteers. In total 3 (with me 4) but the only guy who was there left the other day. Now I'm sending my time in the jungle only with girls until October. Taricaya changed a lot in the last 3 years. Many animals left and new arrived. Places got changed and new cages have been build. The river is very low at the moment and new beaches which I didn't know before exist now. Especially now is the end season for turtles to lay eggs. Furthermore there is winter right now in Peru. First I didn't know the difference because it was same hot and same humidity as I knew from 2013. Well after the first days I learned the difference. Because there's winter it can happen that strong wind from the Peruvian mountains is coming to the jungle. This means a lot of wind and heavy fall of the temperature. This all happened in one night. I was sleeping and a heavy storm arrived which woke me up (I had ear plugs). The temperature fall down very fast so that I had to stand up 3 times to get clothes because I was freezing. The next day we had to wear a pullover.. Now the temperature went up again but it's raining for the next days. But the winter also have a good site. There a less mosquitoes. Instead there are many sandflies.. And cicada everywhere. With the cold weather the animals need to move too and they need to search for food. We saw during this week many groups of Coaties, Holwer Monkeys, Dusky-titi Monkeys, Squirrels Monkey and different species of birds. For the next weeks we looking forward to help the reintroduction project from Taricaya. Since years people killed all the Spider Monkeys in this area and there is no population. Taricaya and especially Raoul B. reintroduced some groups of spider monkeys with transmitters. Most of them arrived as babies and grew up as group. Now the are in the forest and living in the canopies. Some years ago some groups started to reproduce. This species is very important for the jungle! Especially for spreading the seeds of big trees in the jungle. Only this species (and Woolly Monkeys ) can eat the fruits with the seeds of some trees which are key species for the jungle. Without these monkeys the forest will change! So what are we going to do? Well we will be going into the jungle and search the groups. We'll check where they are, how they are doing and how they live now in the jungle after releasing. This data will get compared with wild spider Monkeys (you can ask for more information). Furthermore the turtleeggs will hatch soon and we can release them in the Madre de Dios! By opening the nets during this cold weather we had an amazing result of captures. We had two ringing activities this week with 60 birds and 19+18 species. Highlights: :many Band-tailed Manakins, Forest Elaenia, White-winged Becards, Russet-backed Oropendola, Solitary Black Cacique, 3 species of Woodcreepers, various hummingbirds including a young male Gould's Jewelsfront, Chesnut-capped Puffbird, Bluish-fronted Jacamar and 5 Ivory-billed Aracaria!! Thanks to Rachel! So excited to see how the next week is going!